PERFECT for the new Bridge Mobile! 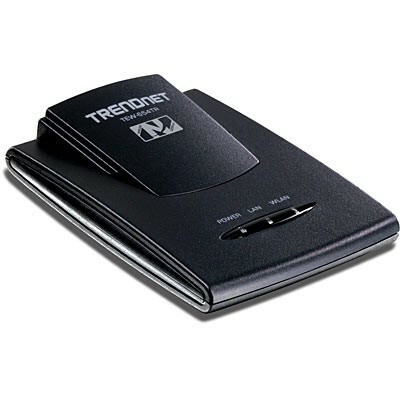 Preconfigured wireless travel (pocket) router kit for use with myView or Bridge Mobile! Just plug it in, connect and go - no configuration necessary, we've already done it for you! Much like a cellphone or Bluetooth headset, this travel router has a standard USB connection as a power jack. That means that in addition to the included AC power cord, you could also power this router by connecting it to a USB port on your laptop. This kit includes a 4-port USB 2.0 hub, just in case you want to use your laptop to power this router but don't have enough USB Ports. The TrendNet Wireless Travel Router Kit offers a high performance router that is so small it disappears in your front pocket (well, if you were to ever WANT to put it in there that is). This compact kit (which includes a carrying case, power adapter, USB power cable & USB hub) fits into the most overstuffed backpack or rolling case and contains everything needed to quickly create a powerful, 300Mbps wireless network anywhere you want. Have special requests, concerns or notes about your setup? Please enter them here.